Director Jia Zhangke captured footage for "The Bucket" using iPhone XS. Posted to Apple's YouTube channel, the brief video runs just under 45 seconds and highlights Zhangke's use of Smart HDR in the creation of "The Bucket." "As a director I need to capture as many details as I possible while dealing with different shooting conditions," Zhangke says. "Smart HDR adds texture to my photos and bring memories of home to life. This is how you touch the viewer's heart." Smart HDR was introduced alongside iPhone XS and XR as an advanced photo processing tool that enables greater clarity and detail reproduction in a broader range of scenarios than previous iPhone models. Powered by faster image sensors, an enhanced image signal processing unit and the A12 Bionic system on chip, Smart HDR captures a variety of frames at different exposures, then merges the best shots into a single image. The result is wider dynamic range that retains detail in both bright highlights and dark shadows. "The Bucket" debuted in January and uses footage pulled from iPhone XS to tell the tale of a son traveling from his rural hometown to an apartment in the city, riding on bikes, ferries and buses while carrying precious cargo from his mother. 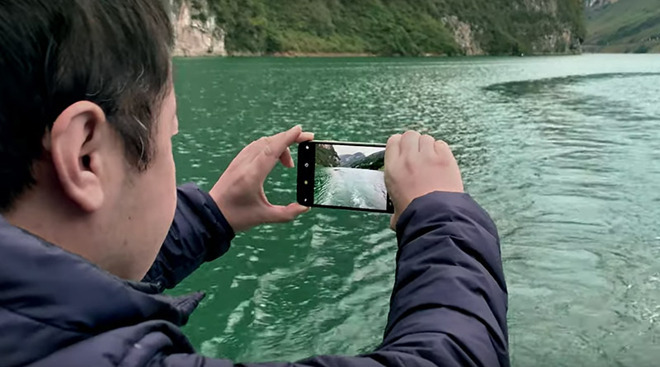 From sweeping landscape pans to bustling scenes filled with colorful props, capturing and grading the film's footage would prove challenging for professional camera systems and editing suites, let alone a smartphone. Today's behind-the-scenes joins two similar segments that aired when Apple first released film last month. Those videos detailed iPhone XS' slo-mo and Depth Control capabilities.